Angels in America is a masterpiece. The script that is. Tony Kushner has crafted a Pulitzer Prize winning text that some would categorize as a Shakespeare of our generation. It's almost certain that every theater student has at some point read and studied in their career. Kushner's text is straight forward, yet has the ability to be interpreted openly when translating from page to stage. In the National Theatre's production of the revival is triumphant, but also features some curious choices that carry through from top to bottom. 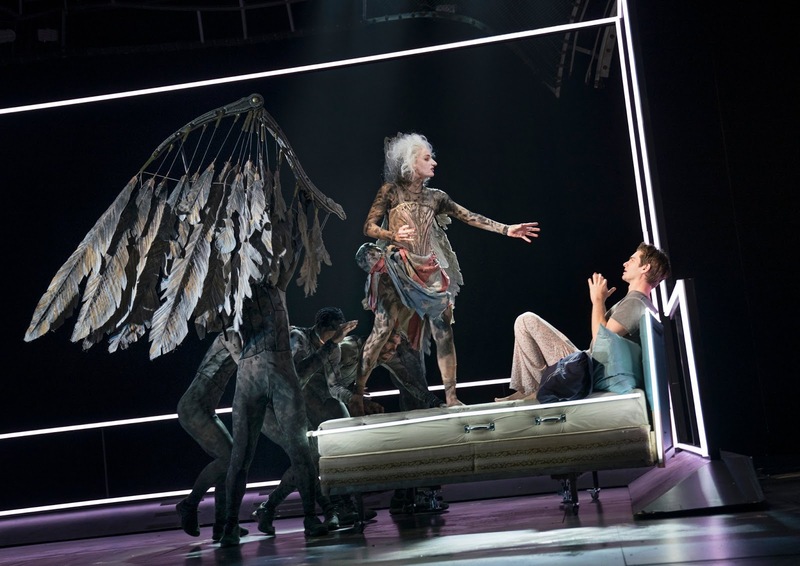 Directed by Marianne Elliott, this revival of Angels in America packs a powerful punch. Elliott takes great care and consideration when it comes to exploring Kushner's story. Her staging is swift and smart, which allows the focus to remain solely on the text. Throughout the design, from marketing to production, the revival has a totally tubular lighting element. The neon tube lights, incorporated in Paule Constable's lighting design brings a bright spot to the darkness of the saga. The scenic design from Ian MacNeil has a very industrial feel to it. It's quite stark and cold. But the star of the design is those turntables, predominantly featured in Millennium Approaches, and the various other surprise elements. Kushner's preamble before the text states his desire to see the theatrical mechanics. As theater technology evolves, those mechanics don't necessarily need to be physical bodies changing the set. But this changes once the Angel shadows are introduced. Scenic shifts can be made technically. Between the neon tubes, the placement of the various locales on the turntables and scenic elements, and the mechanics of how the scenes shift, Elliott does not care about consistency. You would imagine each character or pairing would match a specific color in the tubes, it does not. There are moments that Elliott places the same scene in different locations on the stage. For example, Roy's hospital room is stage right and then suddenly it's placed inside the rising platform. Prior's rooms experience the same treatment. You could make the case that perhaps they were moved around in the hospital, but for the case of storytelling, it's important to be consistent for the audience. The music from Adrian Sutton has a very melodramatic tone to it. It is a gay fantasia, and Sutton brings the drama. When it comes to the costuming, Nicky Gillibrand's design features exactly what you expect. Except the Angel. Gillibrand and Elliott have decided to expose the frailty of the Angel through her appearance, rather than a more glorious creation. Through this version of the Angel, Elliott and puppetry director Finn Caldwell incorporated an ensemble of able bodies to serve as the movers of the wings and Angel. For those seeking a flying Angel, Elliott does no deliver. With the grandiose of Kushner's exuberant epic drama, the most lavish element of the entire text is feeble. But kudos to Elliott for at least committing to this aspect of the production. At the end of the day, Angels in America is a period piece and should be treated as such. Perhaps it's simply assumption, but it seems very unlikely that a Mormon woman in the 1980s would have a hairstyle resembling modern day Katy Perry. Speaking of said Mormon woman, Denise Gough's performance was quite monotonous. She lacked some of the quirky nature of Harper's earlier moments. By beginning Harper's journey at high mania, there truly wasn't much of an arc for the character to go. Following suit in monotony was James McArdle as Louis. His Louis lacked anything but whininess. Everything was the end of the world for him. Some of Louis' monologues make him utterly detestable, but McArdle ensures there's little redeemable about him. On the positive side of the acting company, Susan Brown in the Hannah Pitt track was sensational. From her Rabbit to her Bolshevik, from Ethel Rosenberg to Hanna Pitt, Brown's diversity was undeniable. In the Hannah Pitt track, one of the most difficult tracks in all of theater, Brown never took a wrong step. She brought a plethora of life to the stage. Like Brown, Amanda Lawrence found variety in her performance playing an array of roles including the Angel. Nathan Lane was bitingly funny as Roy. He brought a bit of a charismatic side to the character. As Joe Pitt, Lee Pace gave a heartfelt performance as the torn husband. While he was occasionally lost behind the bolder acts from a few of his scene partners, Pace's take on Joe was raw. Nathan Stewart-Jarrett brought a whole lot of flirt and sass as Belize. Stewart-Jarrett allowed Belize to use the power of words as his strength. Last but certainly not least, Andrew Garfield took flight as Prior by Perestroika. While I worry for his voice with all the screaming, when Garfield was given room to play in "prophet" mode, he was at his finest. The National Theatre's production isn't the first revival in New York City in the new millennium. In 2010, Angels in America was given a starry Off-Broadway production at The Signature Theatre. There was an intimacy that that production had that this production lacks. Theater space may be a major factor, but the lack of intimacy means the grand nature of Tony Kushner's epic is in full force. And this production was felt in epic proportions. Was this the greatest version of Angels in America? Probably not. It was certainly grand, but when you have a perfect script, it's easy to scrutinize the tiny choices.